Launched in 2017, we have a great team of friendly and knowledgeable staff who will go out of their way to help you with your eyecare and eyewear needs. We are open 6 days a week, with eye examinations on 3-4 of those days so we can get you booked in at a time to suit you. 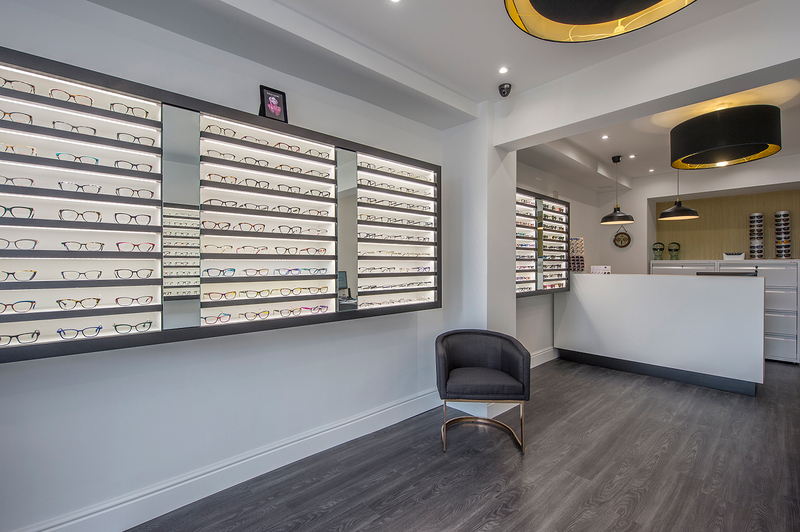 We have a fully-qualified dispensing optician in every day to guide you with frame and lens choices or for adjustments and repairs. We allow up to 40 minutes for our eye examinations which means we really get to know how you use your eyes and address any issues that you may be having. We have top of the range testing equipment and offer Optomap ultrawide digital retinal screening, for an unparalleled view of your retina to help us diagnose any medical or eye conditions. There is a large range of frames which we constantly review and refresh. Several of our collections are exclusive to us in the York area. We stock brands from the famous like Tom Ford and RayBan to lesser known but equally fabulous Etnia and Face a Face. It’s important to have an eye examination on a regular basis, not only to ensure that vision is satisfactory, but also to check the health of the eyes. Here at Cameron Beaumont we give all our clients a thorough 'tailor-made' examination by taking full details of any family history, general health issues, previous ocular conditions and lifestyle requirements. We allow you the time to discuss any issues about your eyes and take time to explain the tests and results fully so that you leave satisfied and with the best possible advice. We also offer eye examinations under the NHS so please contact us to check eligibility. The Optomap Retinal Scan gives us the most extensive view of your retina (the back of the eye) technology permits. This examination helps us check the health of your retina and detect early signs of many conditions which, if left untreated, can affect your sight. In addition, the retina is the only place in the body where blood vessels can be seen directly. This means that signs of some non-eye diseases (e.g. stroke, heart disease and diabetes) can also be viewed. Early detection helps save sight and lives. Conventional photos of the retina only capture 15% of the retinal surface whereas the Optomap can capture up to 80% without the need for any eye drops to dilate the pupils. Optomap is suitable for all ages – from children to adults (even if cataracts are present). The procedure is very quick, simple and nothing touches your eye at any time; the push of a button generates an electronic image of your retina, which we can then instantly examine to ensure the retina is normal and healthy. Optomap allows you to see what we see in a unique 3D sequence and the image will then be kept for comparison at your next visit. We believe the Optomap Retinal Scan is one of the most significant advances in eye care we have seen, and we recommend that all our patients make this part of their regular eye examination. Contact lenses are a very popular and safe form of eye correction today. We are a Centre of Excellence for Johnson and Johnson Acuvue products and we have a wide range of contact lenses to suit everyone’s needs. Whether you have a high prescription, need help with reading or just for sporting, cosmetic or social activities, there will be a contact lens that is right for you. Contrary to popular belief age isn’t a barrier to contact lens wear. We have patients as young as 8 and as old as 80 wearing contact lenses. Patients who suffer from reading difficulties associated with these conditions may benefit from an assessment with coloured overlays or lenses. These have been found to aid people with reading difficulties and allow the signal from the eye to the brain to become ‘unscrambled’ and can significantly improve the patients’ comfort and reading ability. Please contact the practice for more information. We take eyewear very seriously at Cameron Beaumont. We source a wide selection of frames from all over the world and travel regularly to trade shows to try and find the best products and something a little bit different! As we regularly update our stock and suppliers please contact us if you are looking for something specific. Our lenses predominantly are supplied by Rodenstock, a company with excellent attention to detail and an unwavering quest to give the best vision. The importance of a good UV blocking pair of sunglasses cannot be underestimated in protecting the health of your eyes as well as the physical and cosmetic benefits they provide. Blocking the sun’s harmful UV rays has been proved to reduce the risk of cataract and macular degeneration. Cameron Beaumont carries a wide range of sunglasses from designer to sports, available with or without prescription lenses.